How do I know if my shop is suitable for a surcharging ATM? Cashzone will only install an ATM in a location that they feel will be beneficial to both you and them. They do not advise installing a surcharging ATM that is near to a free bank machine. They complete a free site survey at every site before installation. You can check for yourself to ensure there are no free/ non-surcharging ATMs within 0.2miles of your site – just visit http://www.link.co.uk/ATMLocator/Pages/ATMLocator.aspx. If Cashzone do not feel that the site will be profitable for both you and them, then they will not install an ATM. When installed, the ATM will be securely bolted to the floor through its security container by a minimum of 4 bolts into a substantial base. Cashzone can install the ATM into wooden, stone, tile or brick floors. What type of ATMs do Cashzone offer? Cashzone offers new or refurbished ATMs (when available) and all models are supplied with the standard maintenance package included. Who is responsible for insuring the ATM? The retailer is responsible for insuring the ATM cash and the ATM site. Cashzone only supplies self-fill machines and these are a low insurance risk as they are left open at night with no cash in, like your store till. CNG Business Services can help you by providing you with a free no-obligation quotation for your business insurance. For more information on this service please visit our insurance page. How much can I make from having a Cashzone ATM through CNG Business Services? On average each Cashzone ATM processes 3,000 successful debit card withdrawals per year and with £0.50 commission on each withdrawal that means you receive £1,500 additional commission per year. Do you provide any marketing support? As with all products that CNG Business Services provides, there is comprehensive marketing support. Cashzone provides a pavement sign, A2 window poster, A5 window sticker and till wobbler that advertises the ATM. They also provide an A5 window sticker that clearly states that ‘No Cash is Left in the ATM Overnight’. What are the technical specifications of the ATMs that you provide? Cashzone provides two types of NCR ATMs. 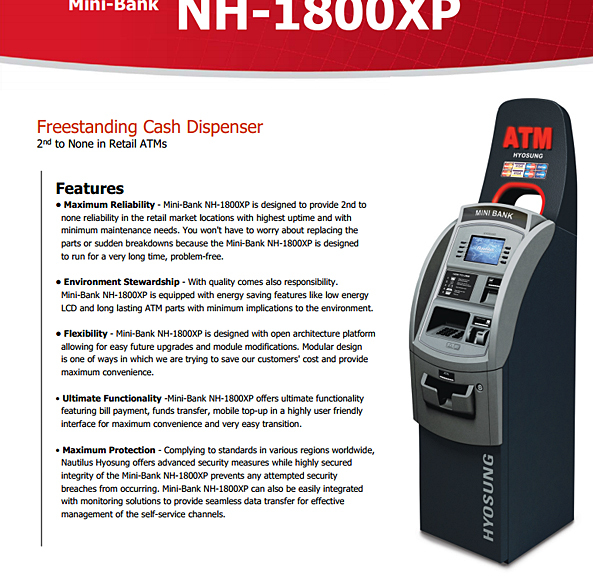 All brand new ATMs are Hyosung 1,500 ad 1,800 and all reconditioned ATMs are NCR EasyPoint. The technical specifications of both machines ATMs are given below. This ATM is manufactured and supplied by Hyosung and is perfectly suitable for convenience stores, newsagents, pubs and clubs. This range of ATMs is no longer in production however Cashzone still deploys reconditioned ones and that are also suitable for convenience stores, newsagents, pubs and clubs.